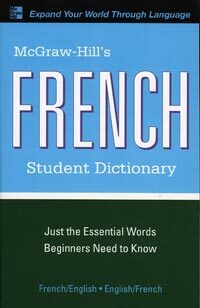 A reliable bilingual dictionary with basic words you need, not the advanced terms you don't. Featuring 3,500 essential words with grammatical information, an easy-to-use pronunciation guide, verb conjugation (when appropriate), example sentences, sub-entries to explain shades of meaning and idiomatic expressions. Also included are helpful appendices of useful information such as common names in French, weights and measures, maps, numbers, and more.